With the Sonics back in the news, it's only fitting that I finally get around to posting about a trade I made with Billy over at Cardboard History. Due to the partial fault of my own and partial fault of sellers on Sportlots, I ended with multiples of Stickums 2 Base cards from 96-97 Collector's Choice. I didn't due to my due diligence prior to purchase to make sure the cards were correctly sorted and neither did the sellers. Only after I was I looking at scans on TCDB did I realize my mistake. The cards were cheap so I didn't want to run the expense of mailing them back for refunds. Rather, I thought I could turn them into a trade. 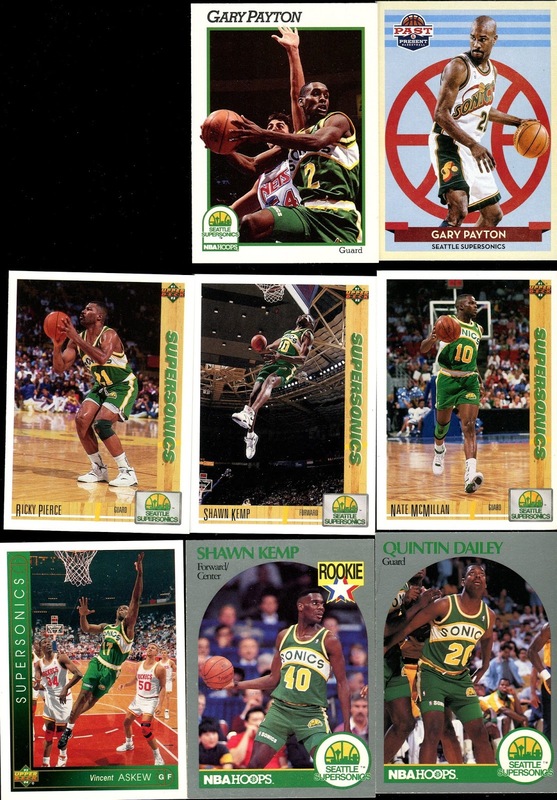 Fortunately, I was able to make a trade with Billy for some Supersonics. He even sent a few more than I asked for! Thanks! I'm not going to bury the lead. 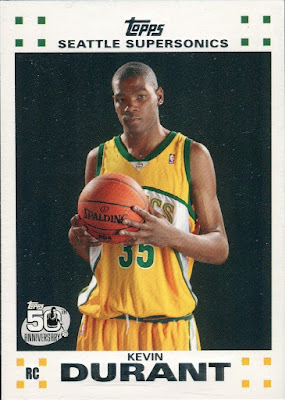 Here is the highlight of the trade: a Kevin Durant rookie card! 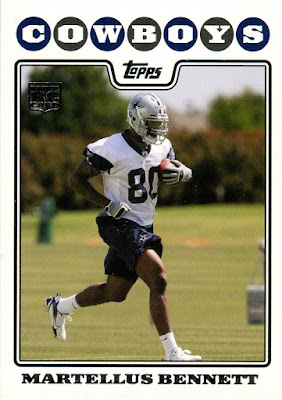 This is actually from the 07-08 Topps Rookie insert but a great card to have either way. It was bad enough that the Sonics were swept out of town by the backstabbing Clay Bennett but Seattle had only a brief glimpse of a likely Hall of Famer. I know everyone and their brother in Oklahoma were mad at Durant when he left the Thunder but I couldn't have been happier. I can finally root for Durant again. 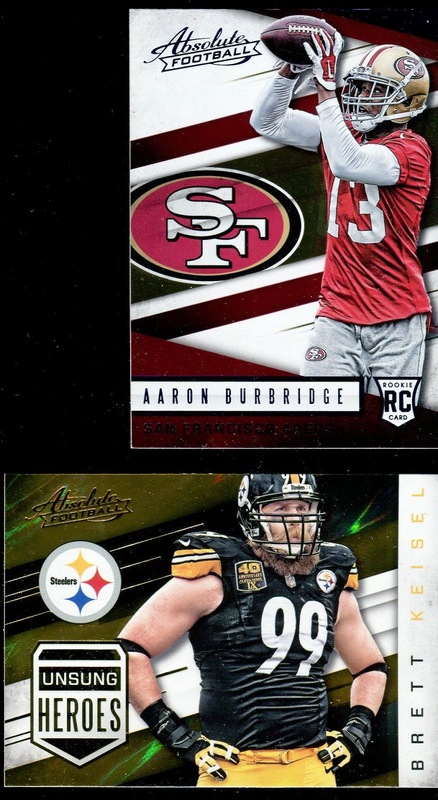 This set name is a misnomer as not all of the cards in the sets are of rookies. 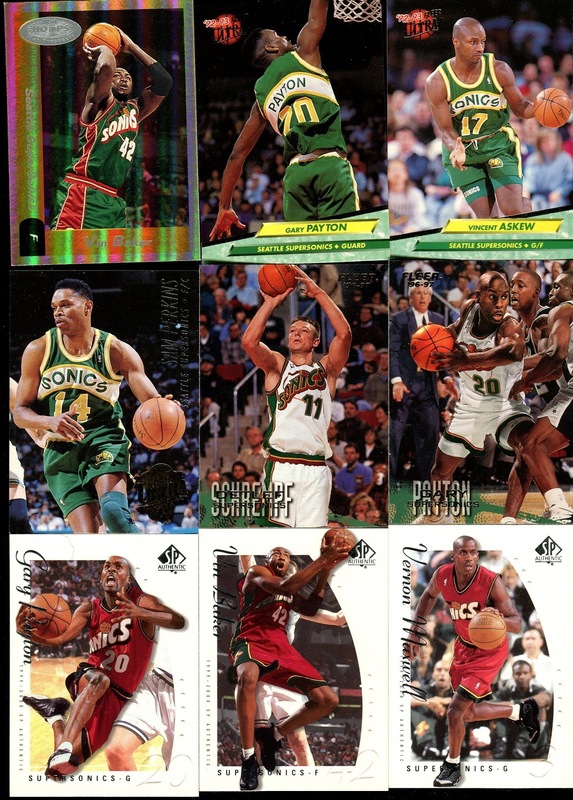 None of these Sonics players were rookies at the time. I still like the look of the cards so I'm willing to overlook the discrepancy. Now that I have Collector's Choice under wraps, I'm considering adding this set to my active set want list. Up above I mentioned that the Sonics were in the news again but it's not the team that is in the news, it's the proposed stadium. Back a few years ago, an investor named Chris Hansen pledged to build a basketball arena in Seattle and bring back the Sonics. Woohoo! Hansen, who grew up in Seattle, should know that this city does not like to make decisions quickly. His plan was to build an arena near all the other Seattle stadiums using $200 million in bonds backed by the city. The Seattle City Council wasn't quite sure if it liked the idea but eventually entered into a Memorandum of Understanding that basically said they would issue the bonds. The major caveat was that Hansen had to secure a team first. The NBA won't even talk expansion prior an arena plan is in place and Sacramento managed to hold onto their team despite a rocky future at one point. This last week, Hansen unleashed a new plan: he would pay for the entire stadium himself. No public money would be necessary. All he wants is for the City to give him part of a public street is necessary for the arena and in return Hansen will pay about $20 million for a transportation project that the City needs to be funded. This is a game changer. The biggest opponents of the new arena are the Port of Seattle ("too much traffic interfering with our freight!") and the Mariners ("it will depress our attendance more than the on the field action!"). If this deal doesn't happen, it will ultimately be due to the Port convincing the City Council that "thousands" of jobs will be lost. Personally, I think it's mere puffery by the Port. There's one more wrinkle to the Hansen arena plan. 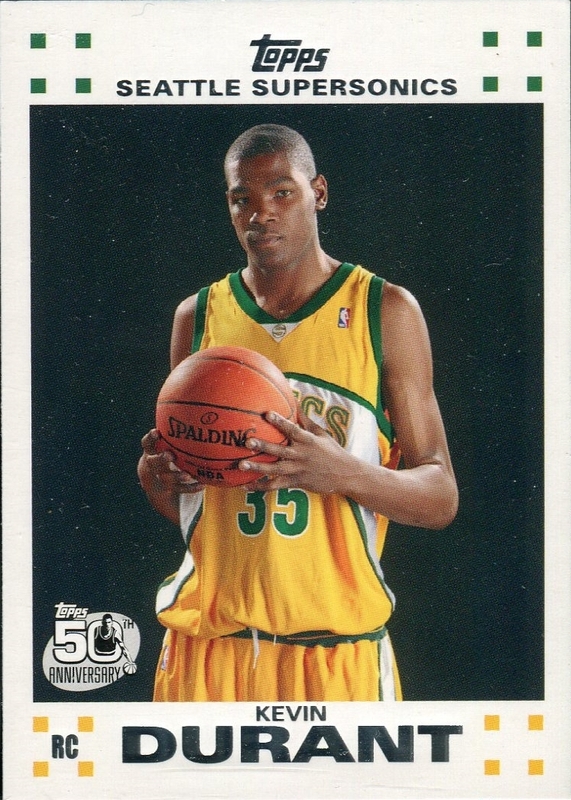 But before I mention that, I want to remark that above is a Shawn Kemp rookie card! The Reign Man! I love it. Back to the Stadium, one would think that with the news of Hansen's new plan, the City would be ecstatic. Not quite. A few days after the news, Seattle mayor Ed Murray announced that the City would soon be accepting Requests for Proposals to develop the Key Arena into a multipurpose facility that could handle NBA or NHL teams. This is mind boggling for several reasons. First, the Key Arena is owned by the City of Seattle. To renovate the Key so that it could handle the NBA will cost somewhere between $200-$300 million. That's $200-$300 million in public money. Hansen is building an arena at $0 cost to the public. Second, the Key is located in a transportation abyss. The bus service to the Key is less than adequate. Hansen's proposed arena is currently served by light rail and multiple, branching bus stops. The Key has very limited public parking nearby. The opposite is true of the proposed Sonics arena. Lastly, the road service to and around the Key is tight. Traffic leaving a new Sonics arena could take any number of roads out of there. 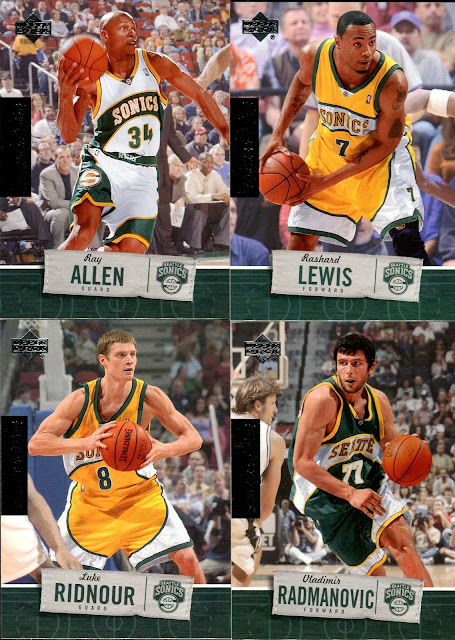 Whenever and wherever we get a new Sonics arena, at least I'll have these Sonics cards. One of my favorite aspects of collecting cards are the relics. I'll probably never buy a full game-used jersey or other item as the prices are more than I want to spend. Even if the relic pieces are small, it's still cool to own a piece of memorabilia connected to the players. Lately, I've been enjoying bat/wood relics more so than jersey relics. Part of my fatigue with jersey relics is that white jerseys are far too common. Don't get me wrong, I still like the jersey but something different would be nice every now and then. Arguably, bat relics are just as boring as white jerseys because the bats are just a plain piece of wood. Sometimes cards companies like to add a personal touch to the wood piece. 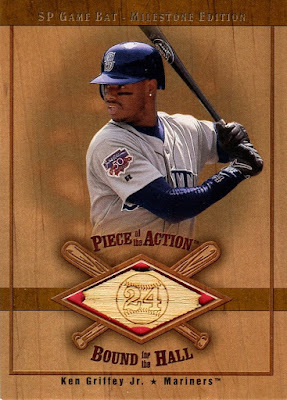 Here we see a baseball and #24 etched into the bat piece of Ken Griffey Jr. Upper Deck still indicates on that back of the card that this is an authentic piece of a bat used by Griffey. Although it's not clear on the card, I think it's safe to say that Griffey does not have small etchings of his number throughout his bat. The modification makes me wonder if this relic piece is now less authentic because it's not presented in its original state. Personally, so long as the card company is still guaranteeing the authenticity of the game-used piece, I'm okay with tasteful modifications. I'm also okay with them so long as they are used in moderation. For Griffey's card, I think the inclusion of the number is done in a pleasing manner. This card has an even greater justification for etching the logo into the floor piece. The game floor is not from the Key Arena, home of the Seattle Supersonics, but from a "basketball floor in which Rashard Lewis played on during an NBA game." That tells me nothing. Who knows where this floor came from. 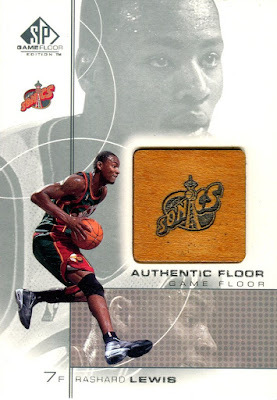 At least with the Sonics logo, the floor piece feels more authentic to the player. 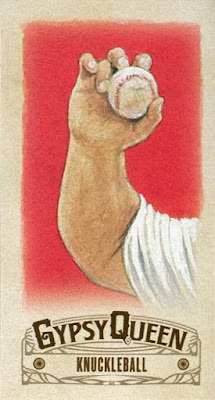 Since I'm on the topic of bat relics, I wanted to include a card that is the best of both worlds. The jersey piece is not white but a cream color. These are the Sunday alternates that the Mariners wear only for Sunday home games. 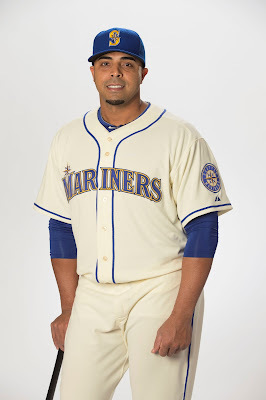 I really like the look of the cream alternates and I bought my first ever baseball jersey in this style. 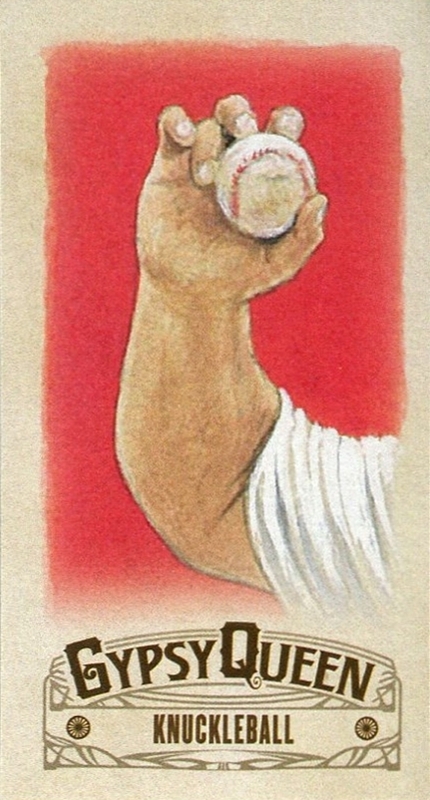 The bat piece is from Nelson Cruz's "boomstick." That's the nickname that has been given to his baseball bats. I just like the idea of having a piece of the boomstick. 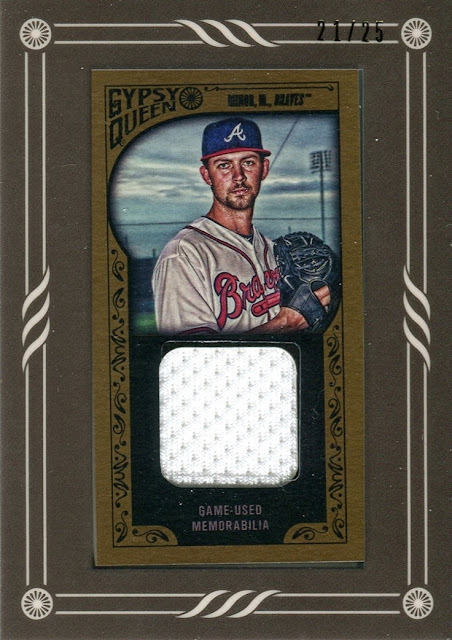 No modification was needed here for the bat relic and if there was it would have severely diminished the look of the card. What are your thoughts on modified relics? Love, hate, don't even like relics? The big rain/wind storm that was advertised for the weekend never came. That was fine by me as it meant I never lost power. The lack of a storm was pretty evident as I was driving down to a card show. There were patches of blue sky and not a drop of rain. Storm or no storm, it was a good day for a card show at a local mall. 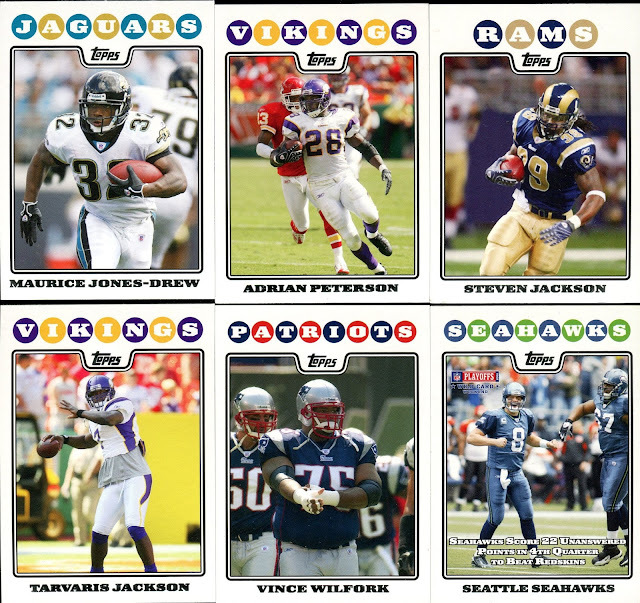 One table had a 6-for-$1 box, which had a sizeable amount of 2008 Topps Football. Sensing I could get a deal, I held up the giant stack of cards and asked how much. After some hemming and hawing, the dealer said $5. I would have paid $10 for that stack so I'm glad I held my tongue. There ended up being almost 120 cards, which means I scored quite the deal. Furthermore, out of the 110 rookies in this set, my stack had probably 100 of them. 2008 was the first year after Favre left the Packers. 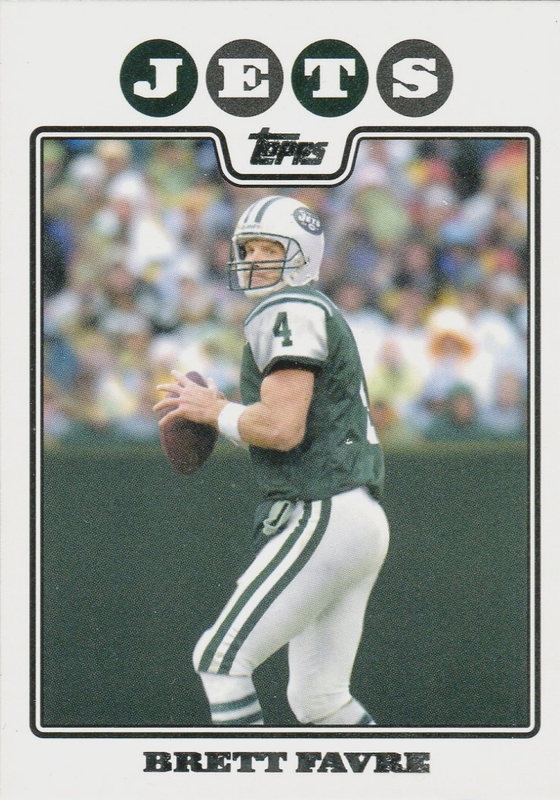 This happens to be a variation of the Favre base card and it's the only one of him in a Jets uniform. It just looks weird. There is also a variation of Favre riding a lawnmower. Looking at the 2008 checklist there are not a whole lot of notable rookies. Bennett is still going strong, now with the Patriots. Being a Seattle area show I knew I would find at least one table with a good selection of Mariners players. 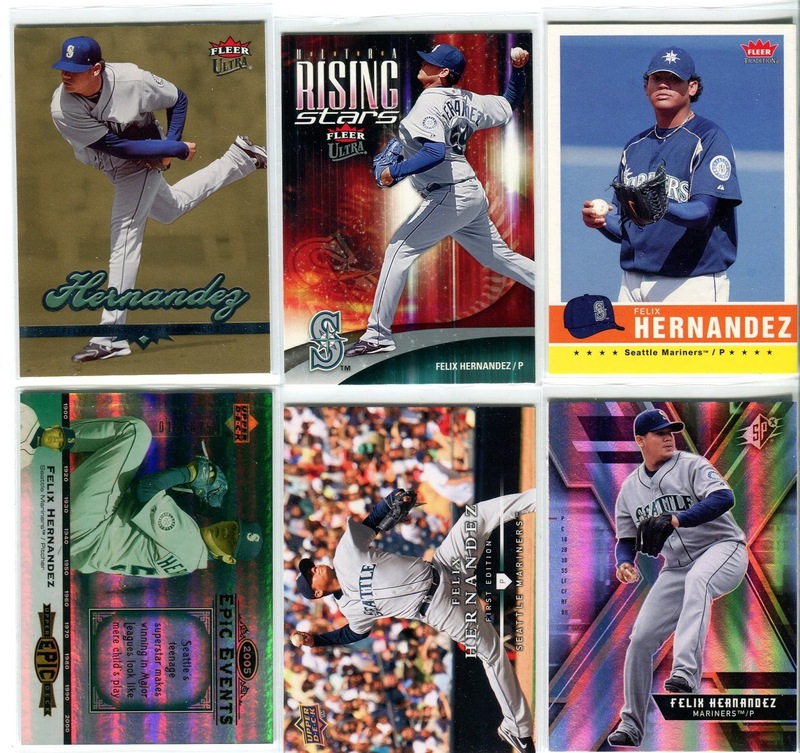 The same table that had to 2008 Topps also had these Felix cards. Most of these were early Felix, which is cool. 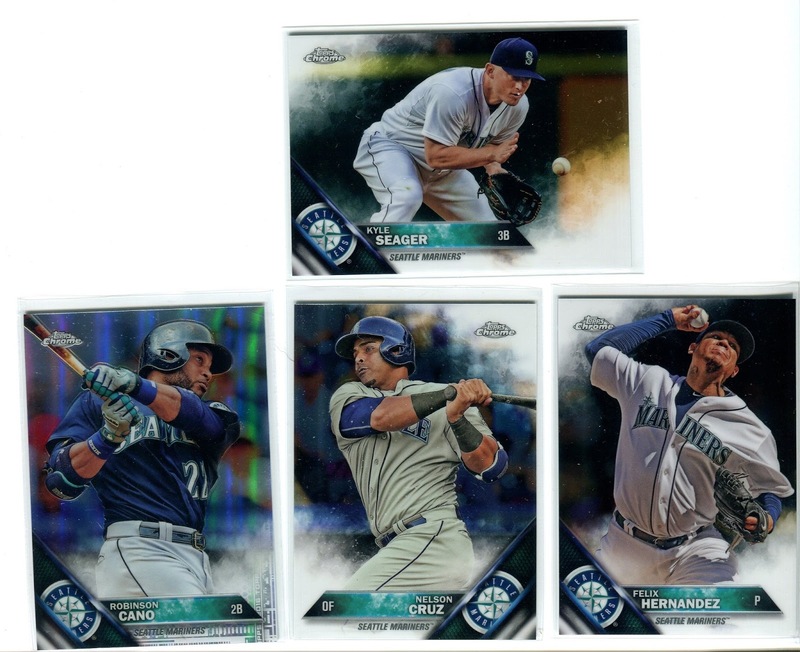 These will go in my Felix PC binder. 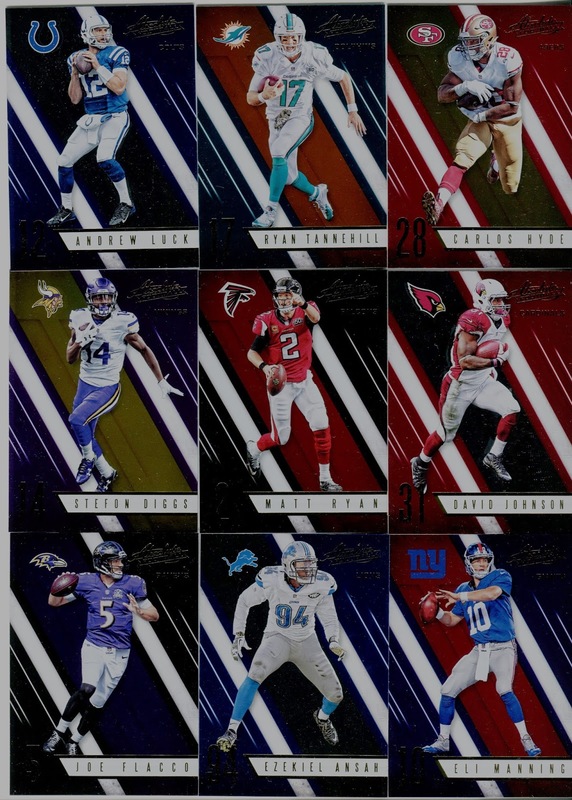 All 2016 Topps Chrome. I don't have a desire to collect this year's Chrome and I traded away a lot of them earlier. But I did want at least the Mariners. The Zych autograph was my most expensive individual card purchase ($3) and I probably overpaid by a dollar. However, that's to be expected for a hometown team. Zych has the distinction of being the last player alphabetically in all of baseball, I think ever. That in itself is worth the purchase. A few random Mariners pickups that can fit nicely into my existing collection of these sets. Cards for my WSU PC binder. Unfortunately, it turns out I already have to the two SP Authentic cards but these cost me about 17 cents each so no big loss. Vince Mayle is a former Cougar and this happens to be his rookie card. For my WSU binder I typically only focus on players in their college uniforms. I think I can make an exception for rookie cards, since at least the college is featured in the stats. 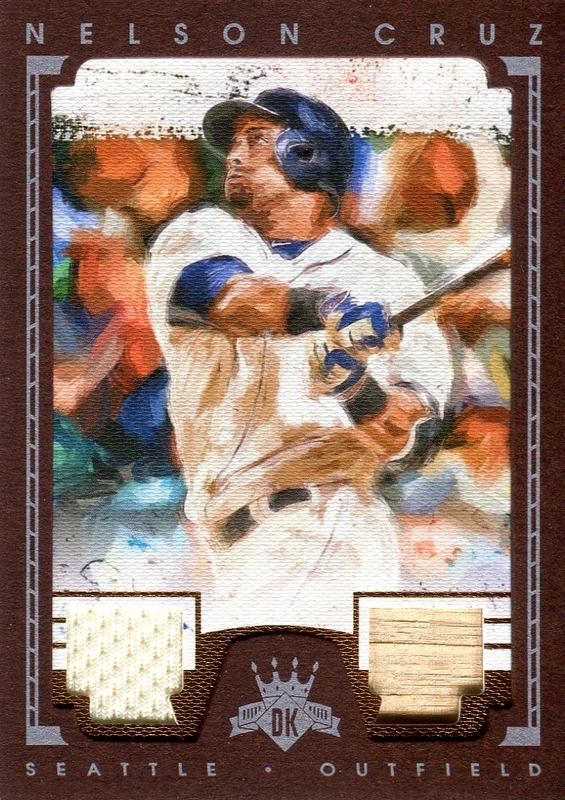 Chrome is not my main focus for 2008 Topps but I like the style so much that I'll pick them up if I stroll upon them. 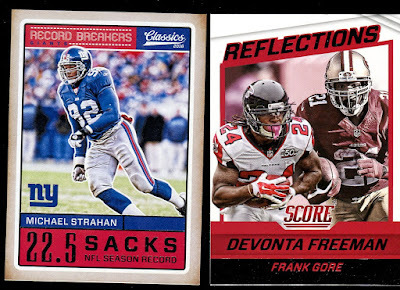 Two inserts from two current sets I collect: Score and Panini Classics. What do you know, 2016 Absolute makes another appearance even though I'm not trying to collect the set. I will collect the Seahawks, though. 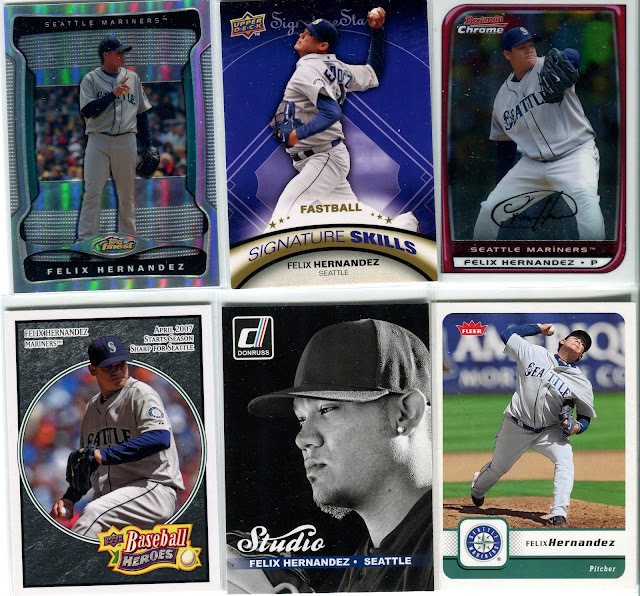 I was really pleased with the amount of 2008 Topps I was able to find. Even if I didn't get any other cards I would have considered this show a success. Rain isn't anything new during the fall in Seattle. The rain is actually welcomed and looked forward to by some (crazy) people around here. I can understand that after a usually brief, hot summer people are ready to put on their Ken Bone sweaters and hunker down indoors. To actually cheer the return of rain though is unforgivable in my book. It's rainy here 9 months out of the year, can't you just let the rest of us enjoy the sun? Today is the start of the first big storm of the year. It's been pouring all day instead of our usual drizzle. Did you know that more rain falls in New York City than it does in Seattle? It's true. Forecasters are predicting an historic storm this weekend with high winds and flood warnings all across the region. Thankfully, I live at the top of a hill so I shouldn't have any worries about the rain. The wind is a different story as it could very likely knock out the power. To prepare me in the event of a power loss, I headed to the store to pick some supplies such as candles, batteries, dry goods, and of course, cards. I also bought a couple nice 3-inch D-ring binders to use for my PC binder and my completed set binder. 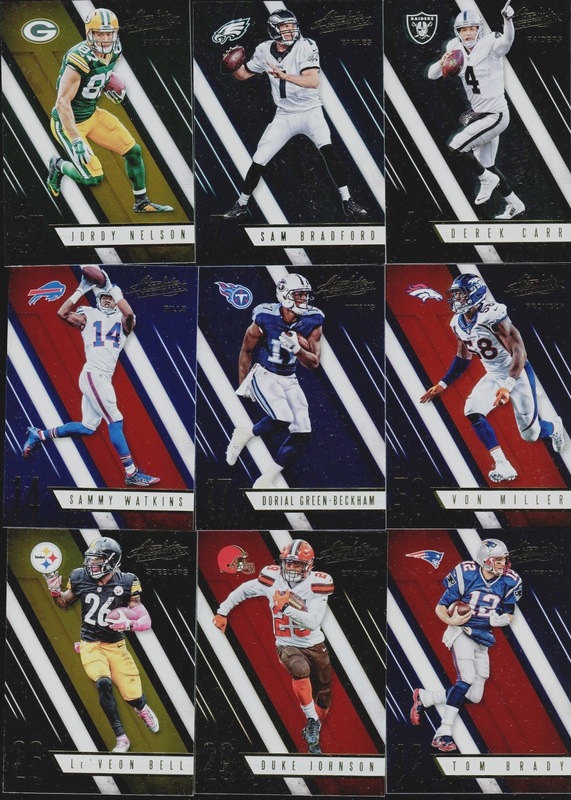 I didn't think there would be any new releases to pick up but I did see packs of 2016 Panini Absolute Football. I initially passed over Absolute in the grocery store because I thought I had already purchased a pack or two. However, after checking my collection on the Trading Card Database I realized I never bought any this year. I decided to rectify that mistake by picking up a fat pack. With most foil cards, the scans never do the cards justice. I never quite know how to adjust the scans to make cards look better. 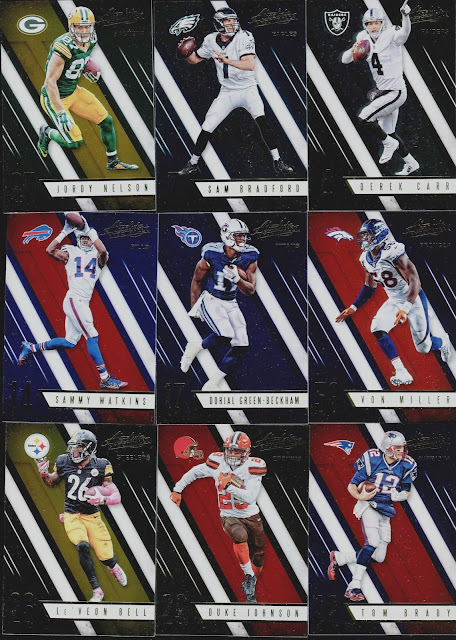 Take my word though, these are slick looking cards. All the lettering is gold foil and the surface of the cards is also foil. Shine on, Absolute. My pack was very QB heavy, with 8 base cards out of 18. I wouldn't mind except I was stuck with Sam Bradford instead of Carson Wentz. No Seahawks cards, either. Fooey. Two non-base out of the pack. The first was a blue, retail only parallel. It's a rookie parallel as well, which is a plus. The second is a cool idea for an insert, Unsung Heroes. 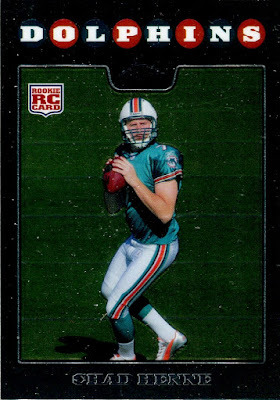 Presumably, these are cards of players who wouldn't otherwise have their own cards. Although if they are considered heroes, then they probably deserved their own base card in the first place. You can sort of see the rainbow refractor in the scan so at least these guys are getting extra special treatment. Will these cards do me any good in the storm? You bet they won't but at least when the power kicks back on, I'll have something shiny to look at. The quest to complete 2008 Topps flagship across all sports continues with another trade with Bo over at Baseball Cards Come to Life. He sent me a message indicating that he had found a small batch of 2008 football and asked if I was interested in a trade. Of course I was so I scrounged up cards from a couple Topps sets from this year. Starting with the rookies, it's no surprise that only one of these players is a current NFL player. According to the NFL, the average career length for a rookie who starts the season on the roster is 6 years. Only one of these players had at least 6 years of playing time. Can you guess which one? I'll give you hint, it's not Colt Brennan who never played a snap in a regular season game. Kevin Smith had a productive rookie season with 8 TDs and 976 yards rushing. That was Smith's best season and he was out of the league after the 2012 season. Allen Patrick bounced around several practice squads but could never land a spot with a team. Devin Thomas is the only Super Bowl champion on the list. He was a member of the 2011 New York Giants. Thomas was a major contributor on special teams. 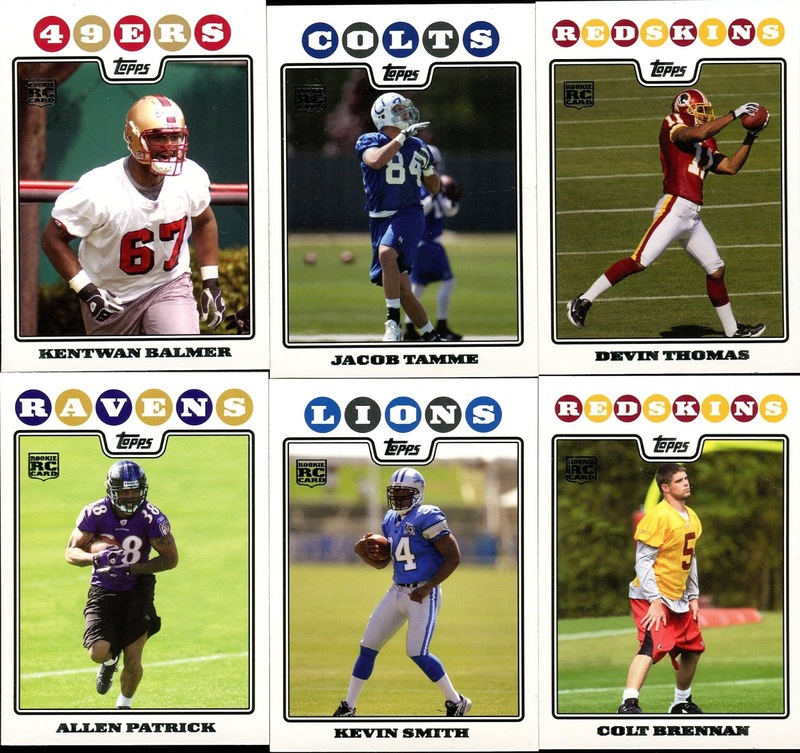 Lastly, Kentwan Balmer played only three NFL seasons. He played his last full season in 2010 with none other than the Seattle Seahawks. That leaves only one man: Jacob Tamme. Drafted in the fourth round, Tamme has had a good career as a tight end. He's played in one Super Bowl, losing to the Seahawks in a route, 43-8. He currently plays for the Atlanta Falcons, who coincidentally, are playing the Seahawks on Sunday. 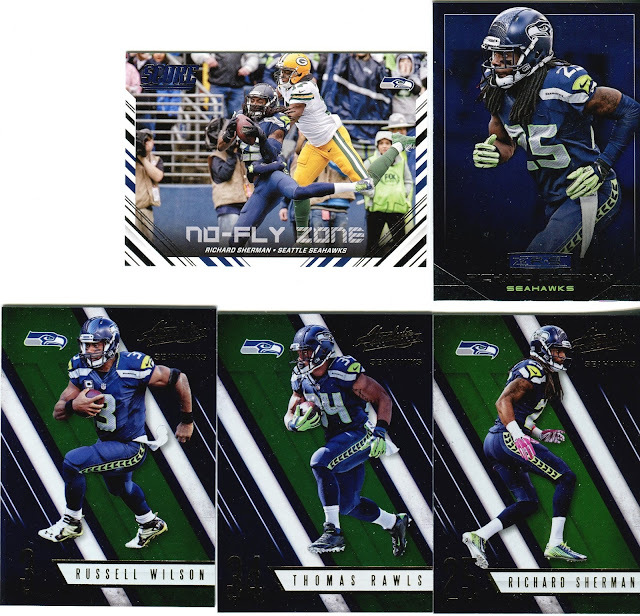 Only one Seahawks card in the package and it's one I already have. However, I don't mind getting dupes of cards in my PC. Tarvaris Jackson would fit nicely in a former Seahawks binder, should I ever start one. He was a serviceable backup. The three running backs at the top of the scan were all great players so it's nice to get those cards. 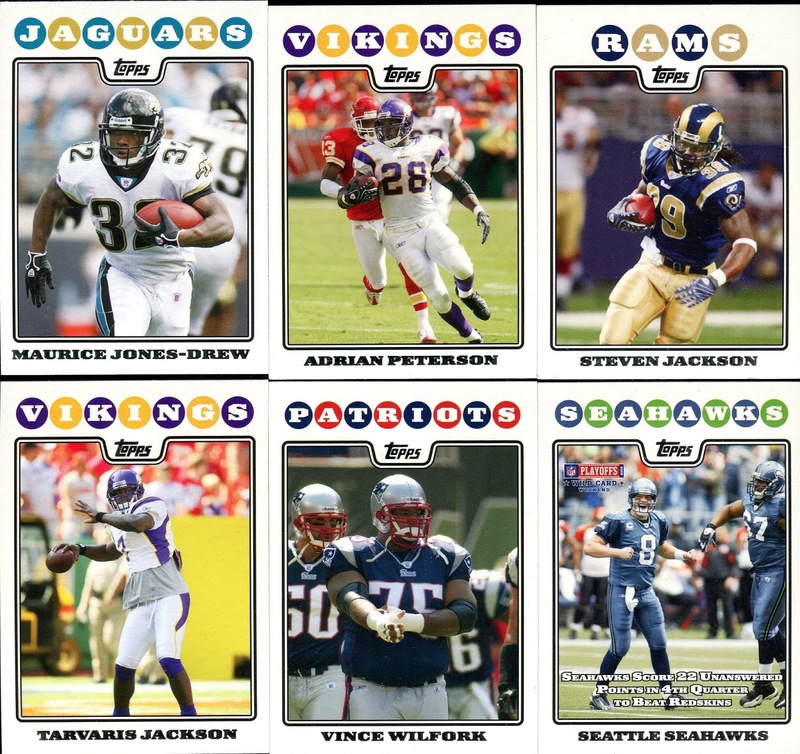 My 2008 Topps football collection slowly grows but it will get there eventually! Oof. It has been far too long since I last posted. I wish I could say I had some great excuse but that's simply not the case. I have not really deviated much from my daily routine. I went to one of the last Mariners home games at the end of September. The Mariners had their annual Fan Appreciation Night. In addition to the team poster giveaway, the team was also giving away prizes throughout the night. I almost won a big screen TV! Well not really. They called out my section but the winning row was way off. For late September, the weather was fantastic. Clear skies and warm temperatures. The game was fantastic as well. The Mariners scored early and the pitching was sharp. This kept them alive in the playoff hunt. Unfortunately, as you can see now, they did not end up making the playoffs. I think there is a lot of optimism for next year. The team store had a lot of items on clearance and I picked up several packs of 2015 Gypsy Queen. For only $7 each, marked down from $15, I bought 4 value packs that featured 4 packs each: 3 regular packs and 1 white parallel pack. Despite having 12 retail packs, I didn't pull much of note. 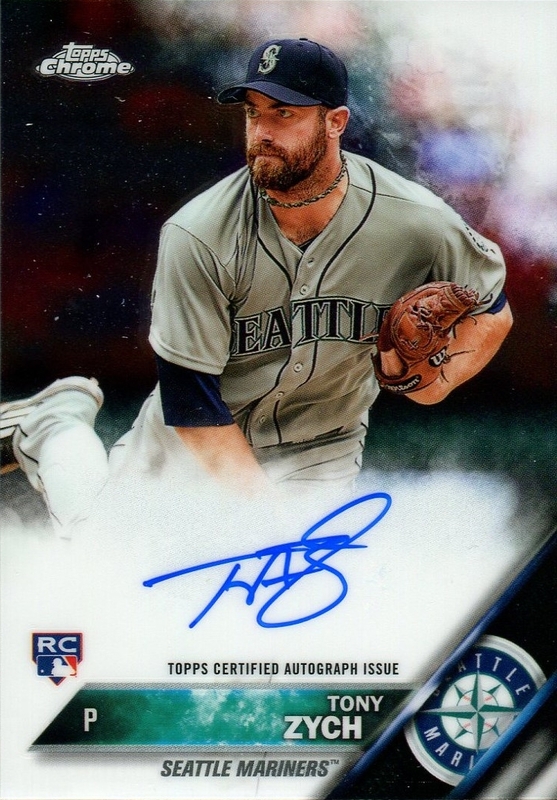 This card commemorates one of the greatest moments in Mariners history. 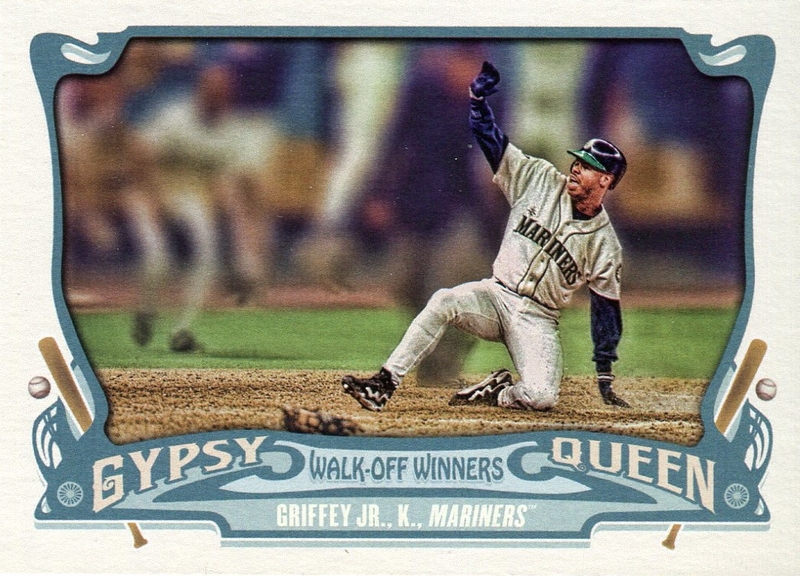 Game 5 of the 1995 ALDS, down by two runs to the dreaded Yankees in the bottom of the 11th, Edgar Martinez hits a double scoring Joey Cora and a sliding Ken Griffey Jr. The Mariners had won their first postseason series. Listening to the call by Dave Niehaus still gives me chills. I should be more excited about pulling a low numbered, framed mini-relic. Mike Minor didn't even play a baseball game in 2015. From what I can tell, he's been injured since the 2014 season. He's with the Royals organization now. Last up is probably my favorite card out of the ones I pulled. 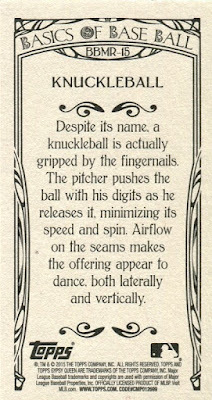 This is from an insert called the Basics of Baseball. 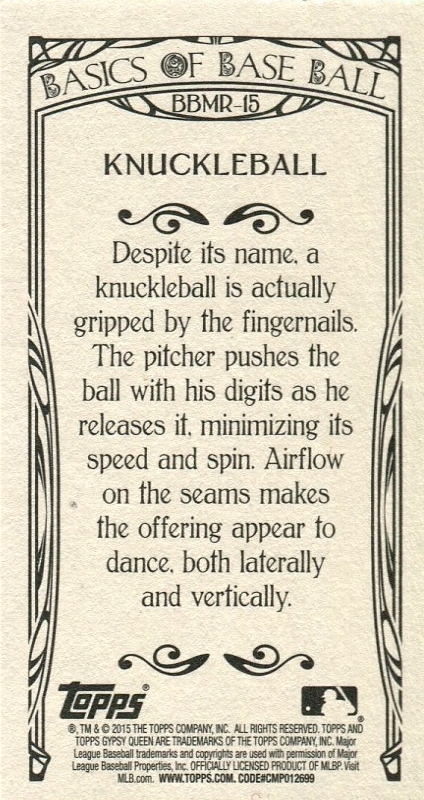 The insert is as simple as it sounds: an explanation of certain baseball terms. Although these are just basics, I like the idea of a set that seeks to create a greater understanding of the game. It's only a 15 card insert so I'd like to collect the rest. These cards were collecting too much dust waiting to be blogged about so it's nice to be able to file them away now. Hopefully this blog won't collect too much dust, either.